The PA Brook Trout Odyssey Team: Charlie Charlesworth (left to right), Hunter Klobucar, Chris Piccione, Matteo Moretti, Sara Mueller, Tyler Waltenbaugh. Not very often does a college kid get told that they’ve been selected for an all-expenses paid, three-week long adventure. So, you know that when four passionate, engaged, and, frankly, pretty quirky fishing geeks were presented with the opportunity to create a life-long connection to the native brook trout that call Pennsylvania’s waters home, there was not a second of hesitation. The trip: The Trout Unlimited Pennsylvania Brook Trout Odyssey. Piggy-backing off of TU’s National Costa 5 Rivers Native Odyssey, Charlie Charlesworth, President of Pennsylvania TU, decided to create something similar, but added a further element of scientific education in the form of research. Behind Charlie, our crew consisted of four crazy fly fishermen who are all officers and/or presidents for their school’s TU Costa 5 Rivers clubs: Hunter Klobucar and Tyler Waltenbaugh (Edinboro College), Christopher Piccione (Colorado State); and me (Matteo Moretti, Middlebury College). Teamed up with Penn State Doctoral student, Sara Mueller, our mission for this trip was to understand the story behind native brook trout from the perspective of fishermen, scientists and conservationists. We’re grateful that we were able to create a long-lasting relationship not only with each other, but also with Pennsylvania’s state fish. On Wednesday, May 30, our crew met up at Keystone College from where we would embark on our trip across Pennsylvania. We followed the entirety of Route 6, ending June 20. Over the course of the trip, we learned about the deep history that hides within the vermicular pattern of the brook trout’s marbled back. Brook trout tell a story and their presence or absence in an ecosystem details history—ranging from the effects of secondary growth forests due to historical logging practices, or the current impacts of global climate change. Aside from being able to fish in places ranging from pristine cascading pools beneath an interstate freeway to remote meandering streams, we also grew as fishermen through our research work with Sara. Sara’s Ph.D. thesis is looking into determining whether brook trout from different watersheds have genetic and physical differences that cause them to act as different species. Our research consisted of two main parts: The assessment of previously unassessed waters for unknown brook trout populations for the Pennsylvania Fish & Boat Commission; and fin clippings for Sara’s work on genetics. The Fish & Boat Commission assigned us a list of streams/coordinates for preliminary assessments. We were able to complete 17. Many more sites were attempted but certain obstacles, such as private land or physical, inaccessibility prevented sampling. Of the 17 streams we assessed, we established that there were four newly documented native brook trout populations and one “new” wild brown trout population. Through our research of unassessed waters using the technique of electroshocking, we learned about the unlikely places that brook trout populations do and don’t exist. It was quite an eye-opening experience when we would electroshock a perfect beautiful mountain stream and find nothing, but then find a thriving population of brook trout in a roadside drainage/culvert. By discovering these new populations, we are helping protect our waters for the native fish. Additionally, by collecting fin clippings, Sara hopes that we can unlock any hidden information about brook trout that is currently unknown. During the trip we were able to meet up with and learn from several other groups and organizations. One day a site manager from Cabot Oil & Gas toured us around a freshwater withdrawal facility for hydrofracking that constantly strives to be environmentally friendly and conscious. On another occasion we spent time with environmental science students and professors from Keystone College, Mannsfield University and University of Pittsburg at Bradford, getting the opportunity to see what projects they were working on and what material they cover in their classes. 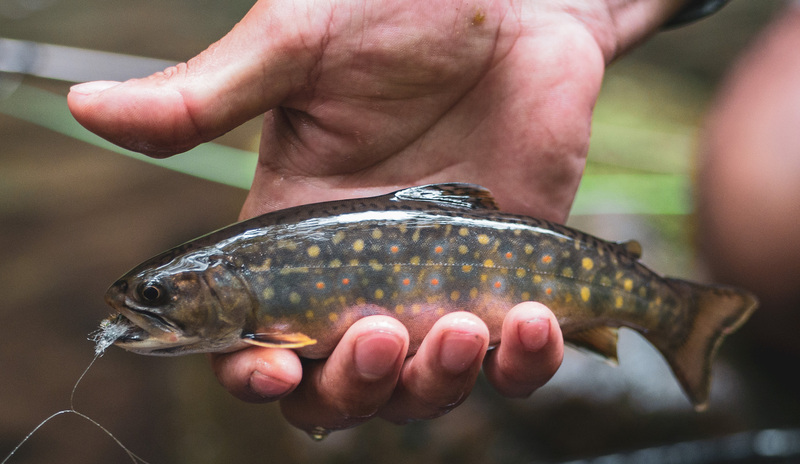 Additionally, we got a glimpse into the work of every day conservation efforts for native brook trout by U.S. Forest Service Hydrologist Chuck Keeports and Luke Bobnar from Western Pennsylvania Conservancy. We used forest debris to create a future fish ladder by building up the stream bed in order to reconnect a tributary to a stream that was previously inaccessible due to the placement of a culvert. Fishing for “brookies” is as much about the fish themselves and their magnificent displays of aggression toward a dry fly as it is about the places it to which that pursuit can take you and the people it can help you meet. It is amazing how one fish could bring together such a dynamic and passionate group of individuals. All of this wouldn’t have been possible if not for the support of Trout Unlimited, the Pennsylvania Department of Conservation and Natural Resources, the Pennsylvania Fish & Boat Commission. Cabela’s and REI assisted with equipment supplies, and funding was provided by Cabot Oil & Gas, Southwestern, Seneca and DKLM energy companies. A 20-minute documentary on our trip is in the work. The film will provide a deeper look at the trip and will shed light on the problems brook trout face—bringing our community into conversation. The documentary is scheduled to be released at the beginning of September. For more on the Pennsylvania Brook Trout Odyssey, check out the group on Facebook and Instagram. Matteo Moretti, a New Jersey native, is a rising sophomore at Middlebury College in Vermont and is planning on double majoring in Conservation Biology and Film/Media Studies.